Fritillaria is the perennial grassy small bulbous plant. This plant is the representative of the Liliaceae family. It is wrong to think, that the name "Hazel grouse" in Russian is the synonym of the name "Fritillaria" in Latin. It’s not a or taiga bird, but the diversity (ripples) of a flower color. The word "Fritillus" in Latin means a glass-shaped vessel for playing in chuck-a-luck. And this word also describes the form of a flower crown formed of motley petals. By the way, sometimes you can hear absolutely false statement: they say that the Latin word "Fritillus" can be translated as "сhess-board". Garden plants encyclopedia. 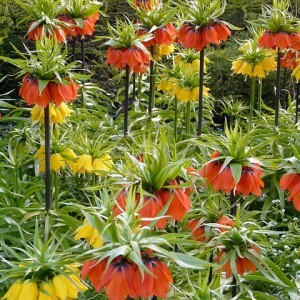 Fritillary cultivation.